Ricotta cheese is apparently not really a cheese. It is a by product of cheese production but it doesn’t contain the coagulant casein that is an essential ingredient of other cheeses. Ricotta is made by coagulating other milk proteins (albumin, globulin etc.) contained in the whey that is left over from the cheese making process. Because ricotta is made from the whey once most of the fatty solids have been removed, it is naturally low in fat. A certain person I know has long refused to believe me when I tell her that cheesecakes can be made from ricotta cheese and not cream cheese or mascarpone. She thinks I’m trying to pass some sort of diet or ‘lite’ cheesecake off on her. Even when I swear on the grave of my departed grandmother that the Italians have been making delicious sweets with ricotta (including cheesecake) for centuries, she gives me a hurt look that seems to say you can’t fool me, in fact you insult my intelligence by even trying. I was determined to prove her wrong so I made an Italian Ricotta Cheesecake. When it was ready to eat I nervously carved her a small sliver in case she didn’t like it. She ate some and declared it “nice but not the same as real cheesecake.” I acknowledged defeat and became absorbed in other kitchen tasks. Ten minutes later I noticed her sneaking back to the refrigerator where she proceeded to cut herself a large wedge, her look was sheepish as she skulked back to the other room with her plate. Rub butter into flour until mixture resembles breadcrumbs. Add water and bring the mixture together into a ball. Wrap in cling film and rest in the refrigerator for 20 mins. Press evenly into the bottom of a 20cm non-stick spring form pan. Bake in a 220c oven for five mins. Beat ricotta, sugar, flour, eggs, orange zest, lemon zest and lemon juice in a large mixer bowl (or with hand held beaters) on high until the mixture is smooth and creamy – about 4 mins. Fold in sultanas, citron and almonds. Pour into pastry lined tin. Bake in a 180c oven until the center is set and the top is golden brown – 1 1/4 to 1 1/2 hours. Cool. Refrigerate 12 -24 hours. Remove outer rim of pan. Mix icing sugar and cinnamon. Sprinkle over cheesecake. Serve with mixed berries or cream (optional). 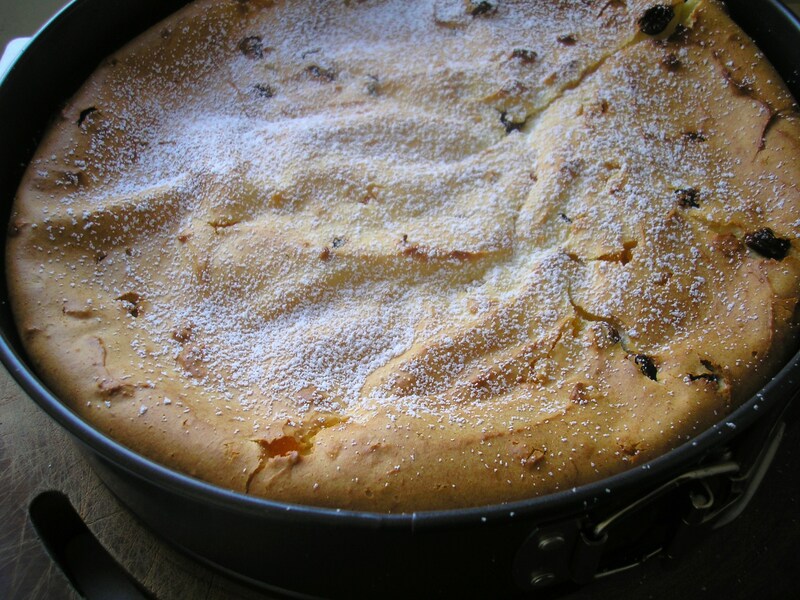 You can soak the sultanas in amaretto or brandy before adding them to the cake. 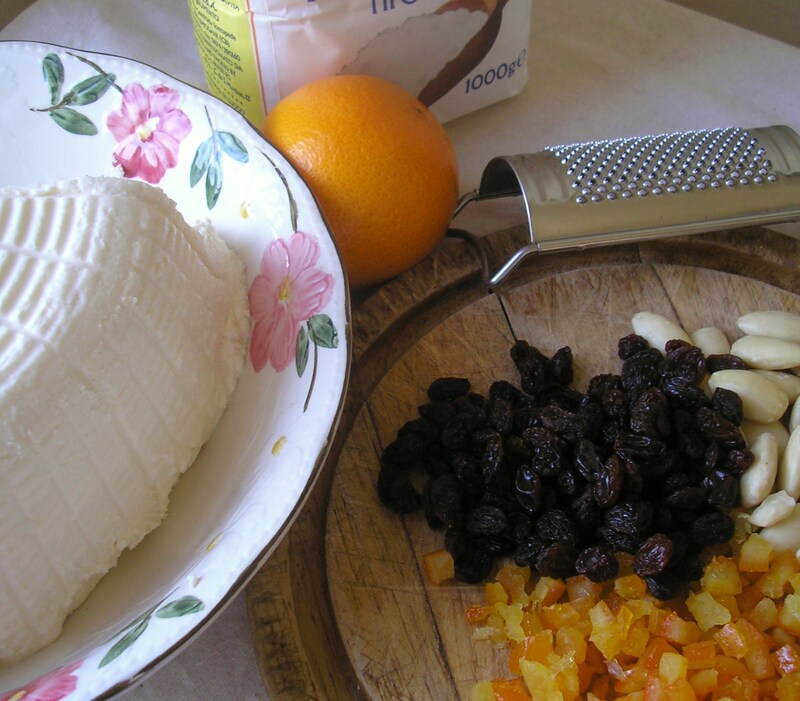 If you want a richer cake you can substitute 250g mascarpone for the same amount of ricotta. I’ve never known that about ricotta! Thanks for educating me :D. I’ve also never made a cheesecake out of the stuff. Perhaps I ought to, as it looks really delicious.